When you are looking at one of our H-D® tours you are bound to have some questions. You're probably thinking, "How much will it cost? is my money safe? what sort of bike can I ride?" or "if I want to stay longer, can I rent a bike from you?" and maybe even, "is this the right tour company for me?". No problem, these are exactly the same sort of questions we would ask if we were in your position! We have put together some Q&A that we think covers many of the most common questions we normally get. Please read these carefully, if you require more information or have a specific question not covered here, do not hesitate to get in touch with us. Why should I tour with Beker’s Motorcycle Tours? Our Harley® tours have been approved and 'Authorized' by Harley-Davidson® Motor Company, which really demonstrates our commitment to quality, great value, and the world wide known Harley® tradition of "freedom of the road and freedom of choice"
We have been travelling in various parts of the world since our late teens on Harley-Davidson® motorcycles, starting out in Northern America and Europe in 1978, thus have a wealth of experience of your motorcycle touring expectation and requirements. 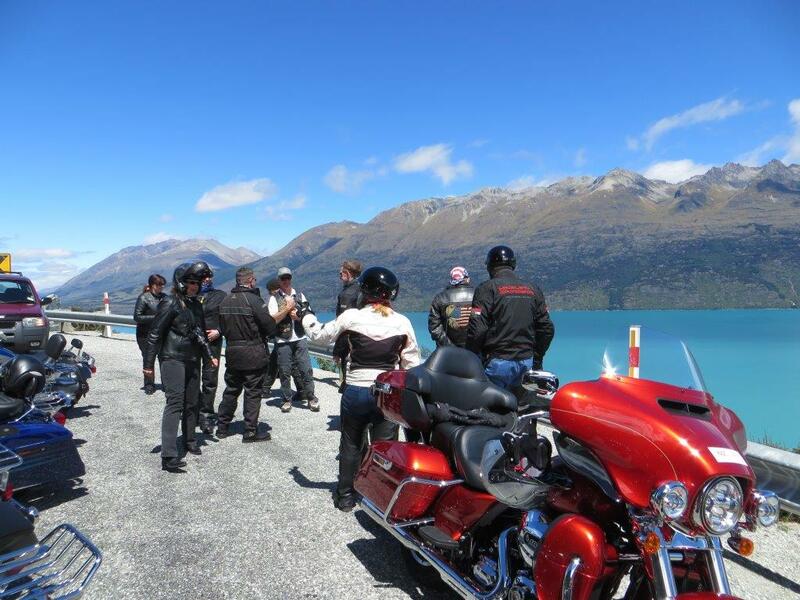 Our greatest joy is to share our passion of riding Harley-Davidson’s® in our picturesque home country of New Zealand and provide you with the best service that we can offer, great roads, wonderful hotels, modern Harley-Davidson® motorcycles and best of all great riding companions. How do we know our deposit funds paid to Beker's Motorcycle Tours are safe and secured? This question seems to be more relevant now than ever before! Under the New Zealand tourism's official mark of quality "Qualmark endorsed visitor activity and quality assured status"
and our ﻿"﻿Harley-Davidson® Authorized" motorcycle tours licence, you can be assured that we have gone through a very rigorous qualification system that can guarantee peace of mind with any of your pre-paid tour funds! Plus we understand exactly your thoughts, as over many years we to have participated as customers in large adventurous motorcycle tours where high dollar deposits had been paid many months in advance of the actual tour date! 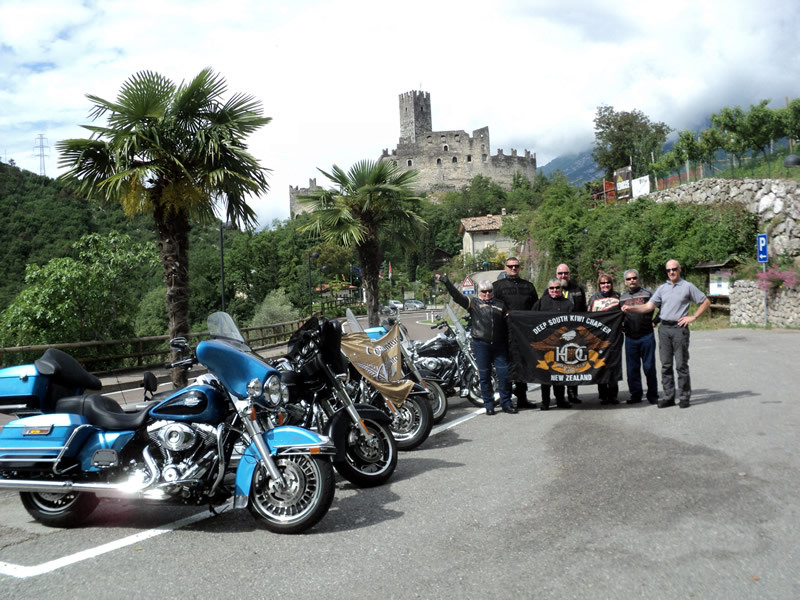 We just love Harley® touring! 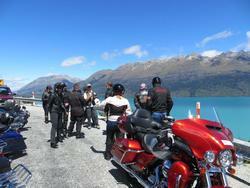 Do you offer any other Harley-Davidson® tours apart from New Zealand? Plus, we now have a number of Harley's® coming on our 'Economy European Alps Tour's' contact for advice if H-D's® are your preference. Check out this link on our Europe webpage below. If I phone for a chat, am I going to get the 'old hard sell' as I am not sure if I have the riding experience for such a trip? Of course we believe that riding in New Zealand and Europe with Beker's motor cycle tours will be one of the best fun riding adventures you will ever participate in! However, we only try to give the real information you require such as evaluating your skill level and help you to understand the minor differences that riding Harley-Davidson's® in New Zealand and Europe may present compared with your home country. How much will a tour cost ? What happens if I have to cancel after I have paid my deposit? Right up until 45 days out from the NZ tour start date, you will get back all monies paid, less a cancellation/booking fee of NZD $750.00 (This applies to a couple, or a single booking). From then on 100% cancellation fee applies. So, how can I protect myself from total loss of tour monies paid if some unforeseen challenge was to crop up? When International Air tickets are purchased, you MUST take out full travel insurance at this time, this way you protect against total loss if you have to cancel your tour due to unforeseen circumstances, travel insurance companies do cover for genuine unexpected tour cancellations. What Motorcycle riding experience is needed for any one of a Beker's motorcycle tour? We feel you should have at least a full year or two of motorcycle riding experience on larger touring motorcycles under your belt before joining a tour, but it varies per person. Broadly speaking, these Harley Davidson® tours are for motorcyclists with at least intermediate riding experience and must be able to master the basic slow riding skills, such as hill stops, U-turns and curvy roads. We have been on many tours with people who did not have years and years of riding experience, but they rode cautiously, safely and reasonable and had a fabulous time. If you happen to be touring with a group, it is more important that you have the sufficient skills and are willing to ride at the same comfort level as the rest of that particular group, the above applies to all the countries we operate our tours in except Greece. Generally speaking, our Greek/Balkan adventures are for the more experienced rider on other makes of motorcycles, at this time. What type of bike will I be riding whilst in New Zealand and Europe? Do I need a visa when visiting New Zealand? Do you provide Route Maps and Tour books? Yes, on all our tours we have our own very comprehensive tour book with many riding tips and suggestions as well as route maps for each days riding. The route maps included in our tour books are only suggested routes and allow for tour members to explore the area based on their own interests. Do you have group meetings where we can ask questions from the day’s adventures and what to expect for the next day’s riding. Yes! We try to meet every day to discuss the route ahead and debrief the days riding and adventures. These safety and heads-up meetings are an important part of the tour as some riders venture out by themselves and need to know as much current information as they can glean. Unless travelling business or premium classes! All Airlines are restricting baggage limits now-a-days, so of course most important is your riding gear and light quick dry garments with a change of tidy dress for evening meals at the hotels. In New Zealand, we endeavour to try and personally meet and greet you on arrival, if this is not possible we will arrange pick-up or forward the details required for a 'no fuss' shuttle or Taxi to take you to your Hotel. For Europe Alps tours, we give all information needed in your 'Tour Book' to get to our Tour hotel with out fuss. How many kilometres apart are the hotels - how far do I have to ride each day? Most of the hotels are only about 3 to 5 hour’s ride apart on the main highways. On a typical day you might ride the Harley® three to five hours, but then with stops for lunch and site-seeing, your day can stretch out into six or even eight hours, your choice! What if I damage the motorcycle, how much am I liable for? If I would like to stay longer and continue riding after tours end, can I rent a Harley® from you for the extra added days? What if I have questions about one of your tours that your web site does not cover?